Drop hammer breaker attachments use a free-fall weight designed to break concrete usually no more than 10 in. thick. In the world of concrete demolition, concrete breaker attachments are held in a high regard. In fact, there is a good chance you won’t be able to get the demo job done without one. There are a lot of upsides to owning rather than renting a drop hammer or hydraulic breaker attachment. Let’s break down the buying process and some of the ways concrete breaker attachment manufacturers are aiming high to fulfill every desire of the demolition worker. Why Buy a Concrete Breaker Attachment? It’s not every day that a contractor needs to wreak havoc on perfectly good concrete. When it happens, there is often a sense of urgency that can complicate rental scenarios. Owning a concrete breaker attachment gives the flexibility to start and stop the project at any time. It also provides the freedom to adjust for project delays or unforeseen work stoppage without incurring additional rental fees or further postponing the project. Whether you’re demoing to reach a leak or preparing a site for future construction, there are important things to consider when shopping for a concrete breaker attachment. There are two common types of concrete breaker attachments: hydraulic breakers and drop hammers. A hydraulic breaker (think jackhammer) uses a gas spring, typically nitrogen, in conjunction with the host vehicle’s hydraulic system, to move a chisel point, in some models as fast as 1,500 blows per minute (bpm). This style of breaker increases wear on the host vehicle’s hydraulic system, loader arms and breaker components. Drop hammer breakers use a free fall weight system with a blunt point to break concrete on impact. A heavy weight (commonly 500 to 700 lbs) is raised by a hydraulic motor, then released to travel a given distance under the influence of gravity. This process will mean fewer bpms, but the result is a significant amount of impact energy that’s transferred to the concrete slab. While this design is simple, it’s effective, introduces little to no wear on the host vehicle and requires very little maintenance. How Is a Drop Hammer Different? Drop hammer breaker attachments use a free fall weight design to break concrete usually no more than 10 in. thick. Since the drop hammer breakers have a large blunt point, they tend to break a larger area of concrete in a much shorter period of time when compared to a hydraulic breaker. Drop hammer breakers tend to fracture the slab, creating several cracks in the concrete. These cracks make it easier for a loader or excavator bucket to find an edge and remove the concrete. Hydraulic breakers use a smaller chisel type of point that moves at a higher bpm rate. This means that they provide less impact energy, so the operator basically has to break each chunk of concrete out individually. Concrete reinforcing rods can be difficult for hydraulic breakers to navigate as well. Drop hammer breakers transfer the energy through the slab which helps to separate the concrete from the reinforcing rod. This is a nice advantage when it comes time to clean up the work area. When in the market for a concrete breaker, it’s also necessary to consider performance factors like speed, noise, flying debris, dust and cleanup. A drop hammer style breaker will typically outperform the hydraulic breaker in almost all of these categories. For work in difficult areas, like adjacent to buildings or vehicles, limiting unintended damage is vital to keeping the job and getting paid. Since the blunt shaft is transferring the impact energy to a larger section of slab with each blow, it fractures a greater area and does an excellent job of separating the rebar from the concrete, making cleanup faster and easier and preventing damage. These performance factors make the drop hammer style of breaker attachment a clear favorite of many seasoned experts. The key to a successful and profitable demo job is hitting it where it counts. Drop hammer breakers run less than 100 bpms while affecting a large area of concrete with each blow. The preferred method of operation is to let the blunt point land in the same place on the slab two or three times in a row until the point begins to penetrate the slab, then move 6 to 12 in. to the side and repeat. By utilizing this sequence in a 3- to 5-ft row, operators become comfortable working smaller slabs like sidewalks, and the amount of time spent repositioning the vehicle is reduced. On larger slabs, start in one corner and work approximately the width of the host vehicle from front to back for the length of the slab, then reposition the vehicle at the front of the slab and repeat until the entire slab has been fractured. It’s important to avoid allowing the blunt point to poke through the slab. If the point sets below the surface of the slab, it can add stress to the breaker and host vehicle when the operator maneuvers left or right. If the concrete breaks easily, simply drop the point one time in each place on the slab then move 6 to 12 in. and repeat. This technique is efficient and will quickly become a favorite for the cleanup crew as well. Everybody loves low maintenance, and the drop hammer breaker attachments is like taking care of a goldfish. Here the simplicity of the design really sets it apart from the more complex hydraulic breaker attachments. Since there is no gas spring, there is no need for recharging. Generally, there are two or three grease zerks on the attachment, and the main channel for the weight will need to be greased. The specific frequency will depend on the manufacturer, but plan to grease the attachment before each full day of use. It’s a good idea to connect the hose couplers when the attachment is not being used to help keep the coupler ends clean and reduce the chance of introducing foreign debris into the host vehicle’s hydraulic system. Drop hammer breakers can be ready to go on the jobsite in just a few minutes, making them easily one of your most dependable machines. 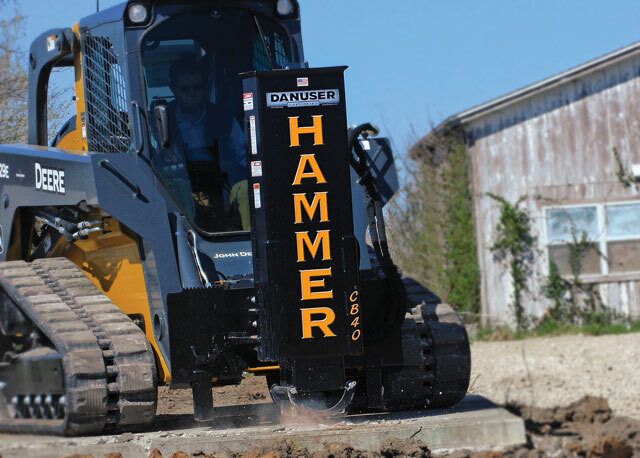 New drop hammer breakers can range from as low as $5,850 up to around $12,000. This is very affordable in comparison to hydraulic breakers which generally start around $7,000 and range easily up into the mid-teens. It’s a good idea to narrow the search to a couple of manufacturers and models, then contact local dealers to get the most accurate pricing and availability. New drop hammer breakers can range from as low as $5,850 up to around $12,000. Traditional hydraulic breakers start around $7,000. There are a few options available for drop hammer breakers. To determine which one is right for you, consult the experts at your local dealership. They can leverage their expertise and resources to give you all the key information you’ll need to identify the best drop hammer breaker attachment option. 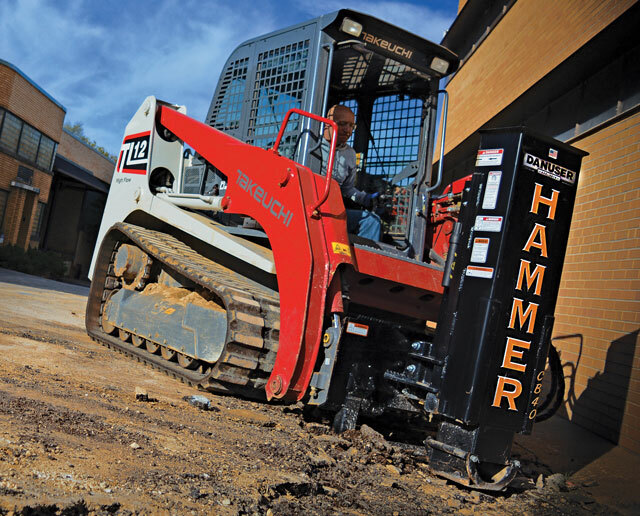 Whether you’re demolishing a sidewalk or excavating a parking lot, drop hammer breaker attachments are the best choice for performance, maintenance and budget. Simply put, a drop hammer breaker will have a higher ROI than a hydraulic breaker on most pad breaking projects, and it will add invaluable flexibility to a contractor’s attachment toolbox. Mike Willis is a sales manager and Kurt Schellenberger is the graphic design and marketing manager at Danuser.